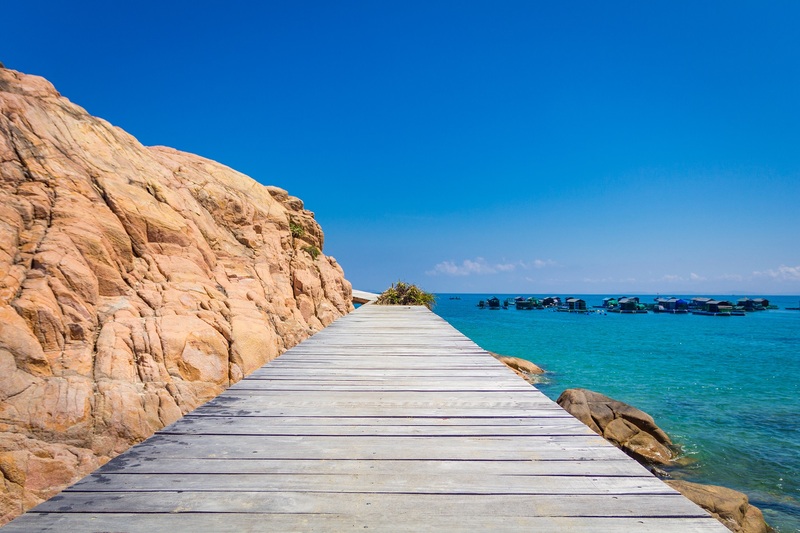 In Vietnam, there is one place that deserves to be visited by more people: Quy Nhon. The city is bordered by green mountains on three sides and beautiful beaches and ocean . Nestled in a bay, the city is protected from storms and heavy waves. Quy Nhon is a coastal city in Binh Dinh Province (the Central Vietnam) with nice and humble local people as well as its famous sceneries such as Ghenh Rang, Bai Trung Beach, Trung Luong Beach (where Queen Nam Phuong once bathed), Han Mac Tu mausoleum – a well-known poet’s name since the early twentieth century, and many other places. Whether you are from Hanoi or Ho Chi Minh City, you can go to Quy Nhon by bus or plane. By bus : Span of more than 600 km from Ho Chi Minh City to Quy Nhon, taking about 14 hours, while the trip Hanoi – Quy Nhon (1100 km) takes about 20 hours. By plane : You can fly from Hanoi or Ho Chi Minh City to Phu Cat Airport and go 30km further to come to Quy Nhon. You should plan your trip to Quy Nhon from January to March because the temperature is just around 20 degrees and unlikely to rain during this time. Other times of a year, the temperature is much heated. If you do not mind, even the summer months are a great time to travel because there will be fewer visitors. If you arrive in Quy Nhon in the period from September to December, it is a possible that your travel plan will be canceled by heavy rain several times a day (as it is a rainy season). You can still enjoy the beautiful beaches but be prepared for frequent storms and you may not be able to travel by boat due to weather conditions during these months. Just taking about 15 minutes to drive from the city center and 40 minutes from Phu Cat airport, FLC Quy Nhon Beach & Golf Resort is located on an area of ​​nearly 1,300ha, embraces fully Eo Gio – known as the best place to view the sunset in Vietnam, a promising ideal place for your holidays, relaxation and meetings. With a desire to offer you a unique and classy vacation, FLC Quy Nhon Beach & Golf Resort owns a chain of villas, hotels, shopvilla, luxury shophouse and more than 80 outstanding utilities. All of 100 villas are designed in European style featuring wide-view towards to romantic Nhon Ly beach with long white sandy beaches; and 326 apartments of FLC Luxury Hotel with luxurious architecture, won the prestigious award “the most uniquely designed Hotel” voted by Vietnam Property Award. FLC Quy Nhon Golf Links – The TOP 3 beautiful Golf Links in Asia. 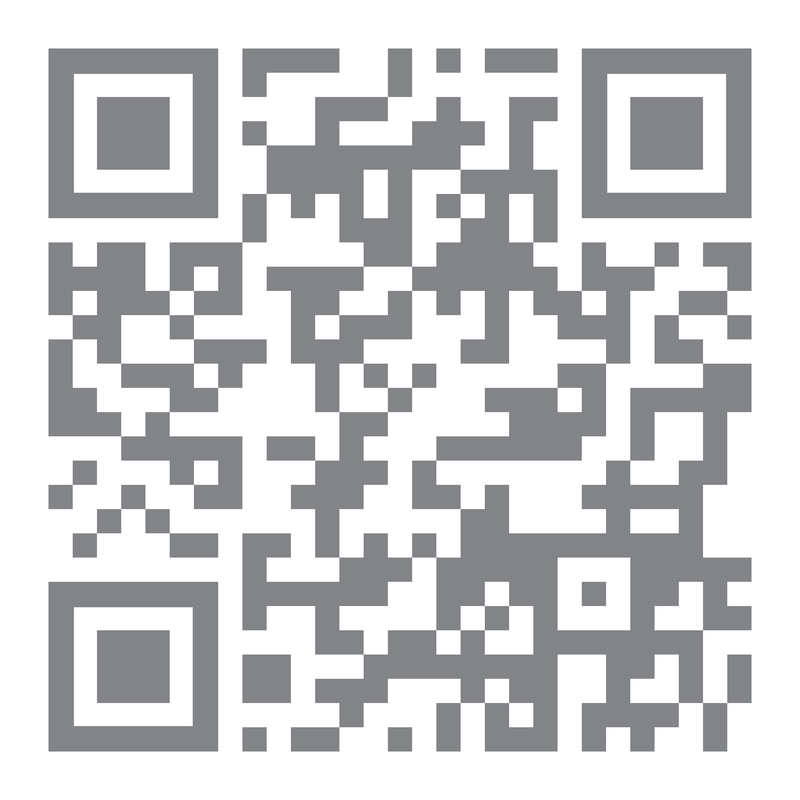 Aquatic entertainment services, sport activities by the sea, etc. In addition, the remarkable projects: The Eden Gallery – Garden of Eden on earth, Lux City – sleepless city, The Coastal Villa – upcoming luxury resort villa with full amenities will give you various options for vacation and investment. Since opening in July 2016, FLC Quy Nhon resort has welcomed thousands of domestic and international visitors and been chosen to hold major cultural and sport events such as the Thanh Tung music night, the live show Dam Vinh Hung, the semi-finals of the Vietnam Global Beauty contest, the biggest FLC Golf Championship in Vietnam participated by thousands of golfers. The bay also provides for the livelihood of many as witnessed by fishermen bringing their catch, women cleaning and selling the product of their work, and patrons enjoying some of the freshest and tastiest seafood in restaurants. Located at the foot of Phuong Mai Mountain. Ky Co beach is fast becoming one of the best choices for visitors. Ky Co has a memorable mix in the different colors of seawater as you approach the beach. From the dark blue of the offshore water, to ocean blue and finally pure jade green. Visitors should try rowing basket boats, diving, fishing on canoes and exploring the life of fishermen. Also, you should enjoy typical local foods such as grilled abalone, and steamed crab or squid which are served by friendly local people. Exploring Ky Co beach and surrounding areas are a must for any visitor. This is a small coastal town, you can go on walk around the center of Quy Nhon or the nearest beach. It is great because you do not have to care about any vehicles. If you plan some trips of a day, it’s best to have a bicycle (if you want to exercise) or a motorbike (if you want to go further). Many bungalows and hotels in Quy Nhon provide free of charge bicycles, so ask about this when you check in. You should also ask the hotel staff for a reliable motorbike rental site to get a good vehicle at a reasonable rate (about VND 100,000 to VND 120,000 per day). For long trips and cost is not your big issue (comfort is a priority), you can hire a driver to take you to the outskirts of Quy Nhon. Also, hotel’s people can help you find a reliable person and at a good rate. Quy Nhon has many things to explore. Whether you are about to relax on the beach or to go out and explore, there are many ways to keep you busy here. 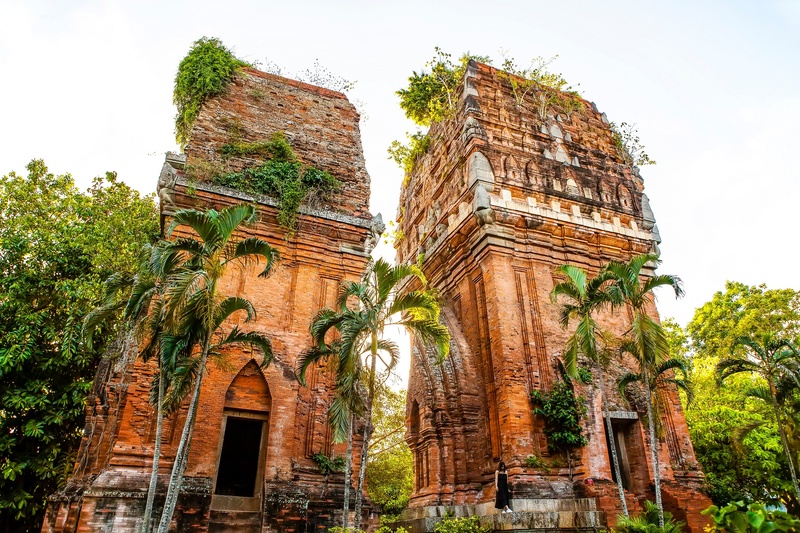 It cake tower and Champa twin-towers : Destination Quy Nhon in Binh Dinh – a province in Vietnam has the most number of relics of the Champa era. Champa are local residents settled in many places throughout Vietnam and Cambodia. They used Quy Nhon as a port from the 11th to 15th century. Do not be surprised by an impressive Twin Towers (named Twin Towers) in the heart of the city. So as to get to another historic site, you should hire a motorbike and go to the countryside to find the It Cake Tower, another Champa tower lies on a hill. It is just a 15-minute drive from the city and you will be delighted with it. The trip will take you through the lush green rice fields, winding small rivers, and finally towards to the tower located on small hills. Climbing up to visit and get a broader view of the coast, fields and behind hills. The sand hills : It is about 20km from Quy Nhon city, located at Phuong Mai peninsula and Nhon Ly beach. In addition to be a lonely and quiet place, they also bring to you an intersting change of landscape. The large sand dunes adjoining to Nhon Ly beach are not only stunning but also a great place to try surfing. Local people will provide the necessary equipment if you want to try the feeling of sliding down the sand dunes. If not, you can climb the dunes and sit to view the coast and the nearby hills. Beaches : Quy Nhon is famous for its beautiful beaches running along the eastern edge of the town. The endless soft strips of sand are very quiet and attractive making it the perfect place to relax and sunbathe. You will find several bars and restaurants on the beach, so if you need a cold beer or fast food, come here now. A local fishing village : As you drive from the city to Champa Tower or Phuong Mai Peninsula, stop at one of the fishing villages you drive through. There are many villages along the coast and it’s a great opportunity to see the fishermen’s life. Depending on the time of day you go there, you can only see women and children in the town while all the men are at the sea, or you will witness them catching back and preparing fish for sale or dinner. Local food : Quy Nhon is located on the beach, you can definitlely enjoy fresh seafood. Since restaurants are still unavailable here, it may be a little difficult to find where to eat. You should ask the hotel‘s receptionist or motels in Quy Nhon where to eat lobster, scallops and fresh crabs. They may suggest some places offering the best culinary and cultural experiences. you will find the freshest seafood there processed with family recipes and served directly from the stove.Wild beaches, fresh seafood, and historical sites … all of which are available in Quy Nhon. Most of international tourists have already ignored this place – this coastal city is a must-visited to escape from the crowds and to experience a true Vietnam.